A newly formed subsidiary of Sun Development, Alden Development Group, is an upscale property developer with a multi-million-dollar condominium project that required naming, branding and marketing. 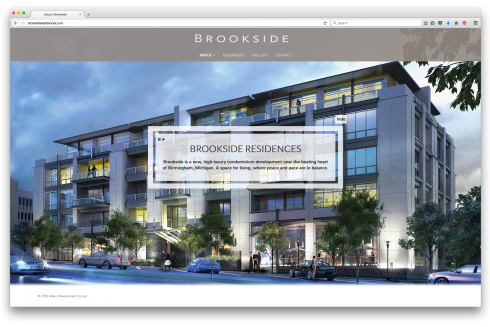 The Brookside project required a robust website dedicated to its lifestyle features, the Birmingham area, and provide a mechanism to advance sales. Beginning first with a wireframe, Centigrade and ADG discussed all the functionality and programmatic requirements which most impact the sales staff and project development team. Via the website Centigrade provided this team with tools to enable the discovery and education of potential buyers. 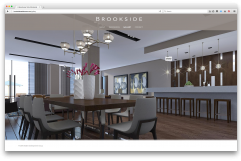 Centigrade and its development team produced a 72-page gallery-style website that informed potential buyers through a story-book of property renderings and lifestyle options within the luxury development.